↑ J. J. Kenneally, The Inner History of the Kelly Gang, p. 17. ↑ "Ah Fook". Glenrowan 1880. 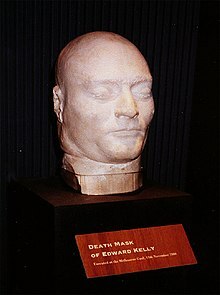 ↑ "The sentencing of Edward Kelly". ironoutlaw.com. สืบค้นเมื่อ 2006-11-11. ↑ "REPRIEVE". ned online. สืบค้นเมื่อ 2008-08-29. Keith Dunstan, Saint Ned, (1980), chronicles lesser known aspects of Ned Kelly's life, whilst discussing the rise of the 'Kellyana' industry. Game As Ned Kelly Game As Ned Kelly - The World's First Board Game based on the history of the Kelly Gang! หน้านี้แก้ไขล่าสุดเมื่อวันที่ 24 ธันวาคม 2558 เวลา 23:54 น.